Many North Carolinians love their wine, and we have many beautiful local wineries state-wide to choose from. Specifically, the Yadkin Valley area serves up some tasty wines and fun annual events you don’t want to miss out on. Sip Your Way through Winter with the following wine events in Yadkin Valley. The Winter Wine & Beer Passport is your ticket to visit several local wineries and breweries in the Yadkin Valley. All Winter long, you can enjoy tastings—and other perks—at participating wineries and breweries in Surry County, the heart of the Yadkin Valley wine region. 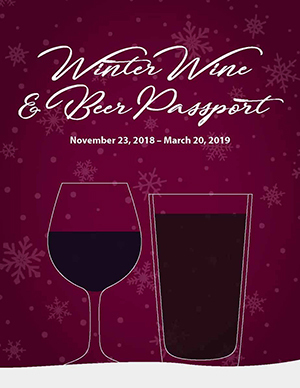 The passport, valid through March 20, 2019, comes with 12 wine and beer tastings at 10 award-winning wineries and two craft breweries; a keepsake wall-mounted cork holder; and discounts at local retailers and restaurants, and on accommodations. Individual passports are $64 and two-person passports are $99. The estimated value of each passport is $225. Wineries participating in the winter 2018-2019 season are Adagio Vineyards, Carolina Heritage, Elkin Creek, Grassy Creek, Old North State, Roaring River, Round Peak, Shelton Vineyards, Slightly Askew, and Stony Knoll. Angry Troll, and Skull Camp are the participating breweries. Passports can be picked up at the Yadkin Valley Chamber of Commerce in Elkin, N.C., during business hours Monday-Friday, and are also available at participating wineries and breweries. For more information, call the Yadkin Valley Chamber at 336-526-1111, or visit yadkinvalleync.com/guides/winter-beer-wine-passport. The 10th annual Yadkin Winter Reds Event is coming up January 27-27 and February 23-24, 2019. 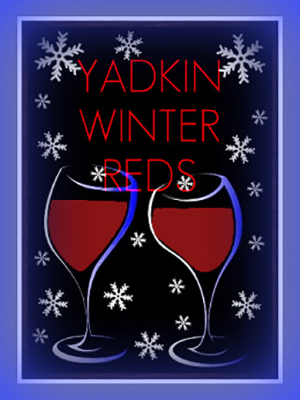 Participating Yadkin County Wineries will feature their “Winter Red” 2 oz. pour paired with a 3 oz. food item. Ticket are $30 per weekend and include one visit to each participating winery. You will be appointed a starting winery, where you will receive a Riedel wine glass souvenir and map of the event. Tickets are good for both days of your selected weekend. The deadline to purchase January tickets is Wednesday, January 23. Wineries participating in the January event include: Cellar 4201, Divine Llama Vineyards, Flint Hill Vineyards, RagApple Lassie Vineyards, and Sanders Ridge Vineyards. The deadline to buy February tickets is Wednesday, February 20. Wineries participating in the February event include: Brandon Hills, Hanover Park Vineyards, Laurel Gray Vineyards, Midnight Magdalena Vineyards, Shadow Springs Vineyards, and Windsor Run Cellars. The Yadkin Winter Reds event is a perfect way to enjoy a day trip or weekend getaway; select lodging discounts are also available. For more information, visit visityadkin.com/Yadkin-winter-reds-event.